Another healthy recipe for the season when the produce is more fresh, affordable and best in taste. For the last few weeks I have been on a healthy streak, trying to control on the food and having a bowl of roughage with my lunch and dinner. At times, I just have a look at the produce I have in my fridge, and come up with something or the other. 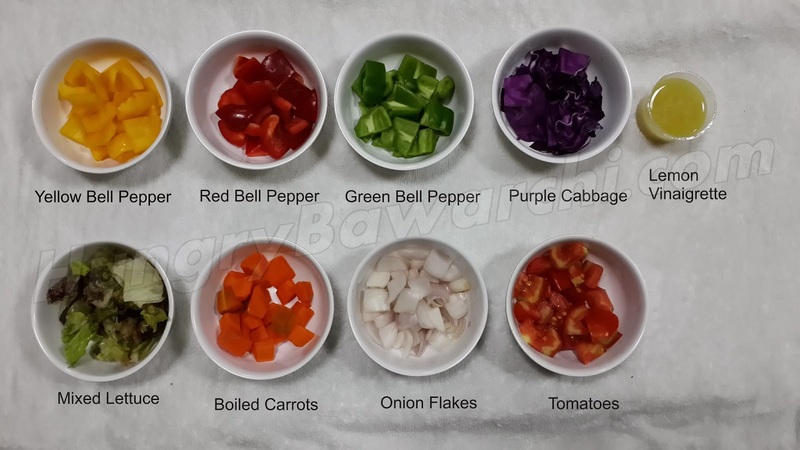 This time, with some recently purchased produce, I came up with this, Garden Salad with Peppers, Cabbage, Carrots and more. 2. Tear the lettuce with hand. 3. For the dressing, in a bowl, take lemon juice, dijon mustard and whisk well. 4. Keep adding the olive oil little at a time, until everything is emulsified. 5. Season the dressing with salt and pepper. 6. 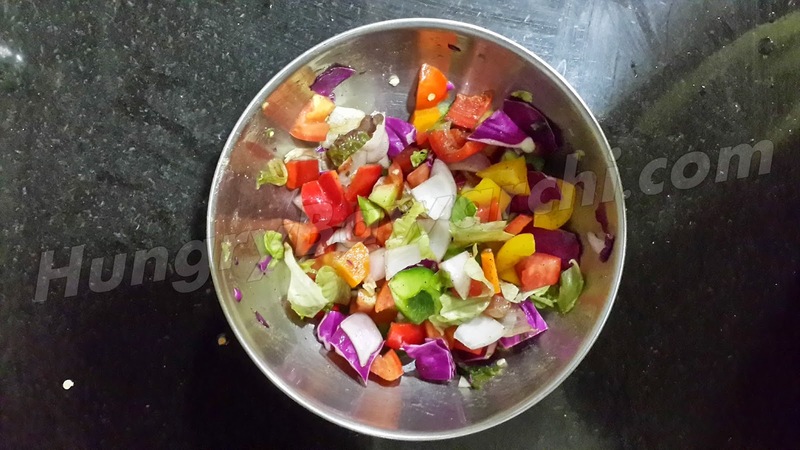 In a bowl take all the vegetables, put in a spoonful of dressing and toss well. 1. To enhance the flavor of lemon in the dressing, add in little lemon zest as well. 2. Keep the lettuce in cold water so that it becomes crispy. 3. 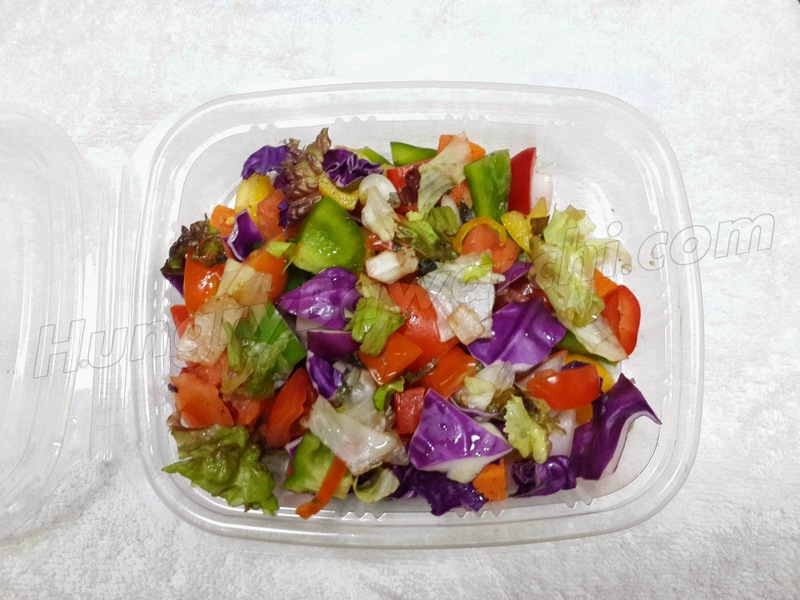 Don't use the knife to cut the lettuce, it might make it change the color, tear using the hands into bite size pieces. 4. Before using the lettuce, damp it with a paper towel, as water will not let the dressing stick to the leaves. 5. Choice of vegetables can be added as needed. Ymm,Only thing can carrots be tossed raw or thinly sliced rather than cooked . In this recipe, i have boiled the carrots, but you can thinly slice them as they will add an extra crunch to the whole salad and another texture as well.